Shabby chic book photo frame. Get your photo on a book cover! Do you want to be on a book cover? It is no longer a dream with Funny.Pho.to! 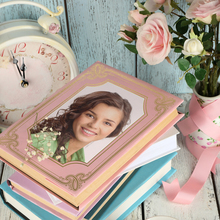 Just place your photo into this beautiful retro scene with a bunch of shabby chic books. For best effect put your own custom text on the book cover.